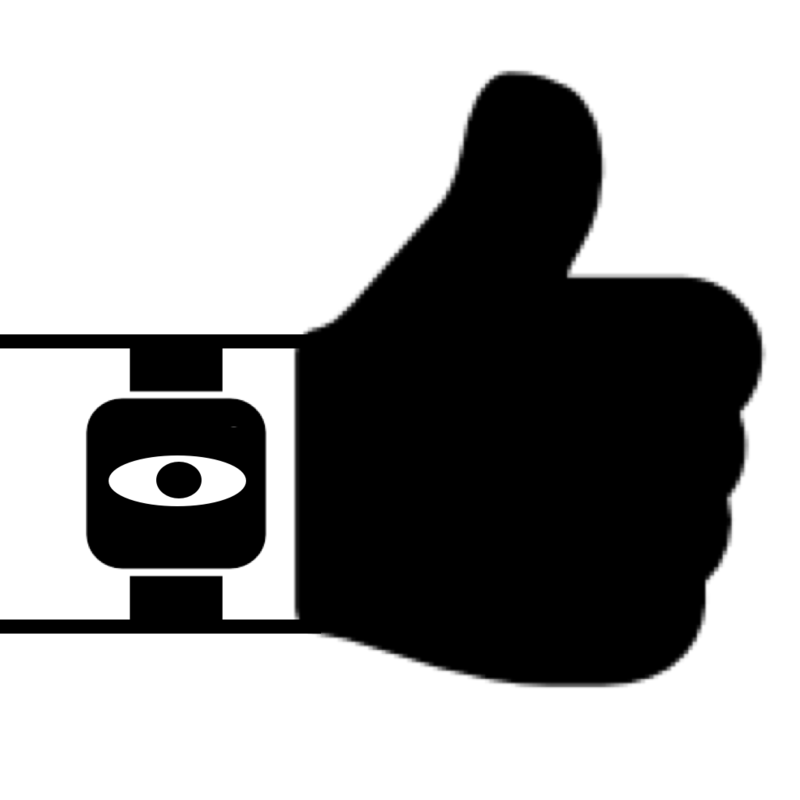 This video is for Apple Watch App: Watch Message. 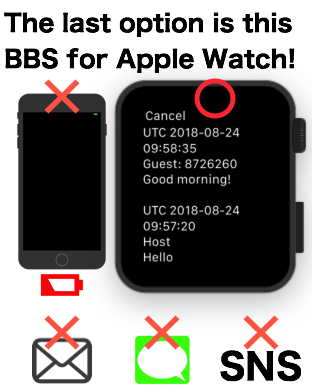 With this app, you can see BBS on Apple Watch. If your iPhone died outside, how do you contact your friends? iPhone could die with various reasons such as low battery, physical damage or system malfunction. In addition, you cannot use mail or message on Apple Watch with your iPhone dead even if your ap-ple watch is cellar model. You have to turn on your iPhone to use them. To avoid the worst situation, I developed this app. You do not need to depend on iPhone anymore. 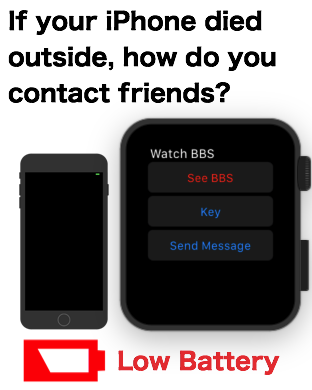 You can contact friends with only Apple Watch. Now, let me show you how it works. 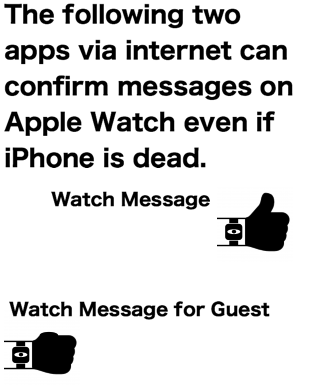 First, let me turn off my iPhone so that you can confirm this app can work on Apple Watch without iPhone. If your iPhone is not cellar model, you have to connect internet through wifi. Apple Watch can solely connect wifi which the paired iPhone previously connected. 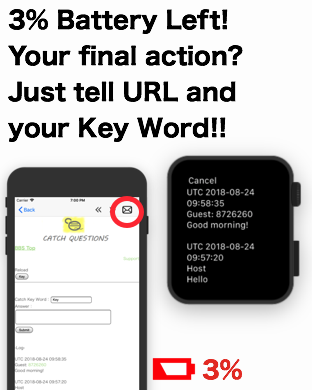 After you start this app, you need to create ID and key word. English or number is acceptable for them. But, I would recommend you to create your ID with auto ID button so that you can create it eas-ily. As for key word, pease create it manually because it will be shared with your friends. Simple key word is easy to remember. Now, let’s send some message. If you are not English speaker, you can call scribble from force touch. After you send it, see it on BBS. 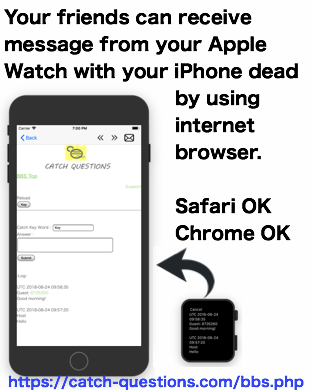 This message can also be seen on Safari. I will use this on this iPad. You can access to the BBS from the following link. From Safari, your friends can confirm your message and can answer your message, too. Let’s try it. The answer can also be seen on Apple Watch. Please be careful. The time to post is UTC because this app is used globally. Well, thank you for watching my video.